A good Luminance contrast can assist people with low vision inidentifying important building elements such as Stairway Nosings,Doorways, Tactile Ground Surface Indicators and Signage in thebuilt environment.Light / Luminance Reflectance Value, or LRV, is ameasurement of light that is reflected from a surface. Some of theways to find the LRV are by means of a colorimeter,spectrophotometer or directly by the manufacturer (for example, LRVnoted on a fan deck provided by a paint manufacturer). LRV /Luminance Contrast is the light reflected from one surface ascompared to the light reflected from another surface. This appcalculates the percentage difference required when the LRV of anytwo samples are know. 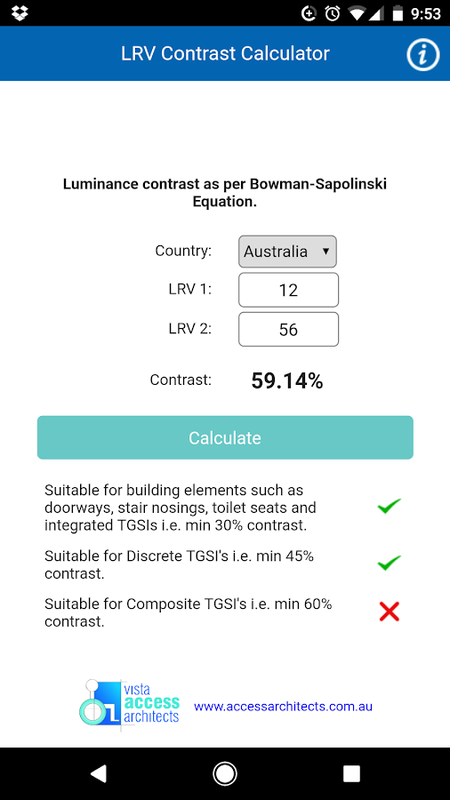 For example, if you have the LRV of the colorof the door frame and the LRV of the color of the door, you can usethis calculator to determine the contrast in % based on theformulas used in either USA or Australia. Flowdia is an easy to use flow diagram tool that can be used toquickly create professional quality flowcharts, mind maps, BPMN,network and server layouts, Cisco network, Rack diagram, UMLactivity, business process and process flow diagrams. The app isdesigned with ease of use in mind. You can quickly connectflowchart shapes by simply selecting the start and end connectionpoints and quickly add new lanes to a swimlane diagram or newsub-topics to a mind map diagram by using "+" button from theselected swimlane or mind map shape menu. The mind map sub-topicsare automatically positioned on the page but can be easily moved asrequired. Flowdia supports export of the diagram / flowchart toPNG, JPG, PDF and SVG formats. You can view exported SVG files inMicrosoft Visio. You can import custom PNG and JPG images. You canadd up to 10 pages to a diagram and copy, delete and rename pagesas required. The following diagrams can be created using Flowdia: -Flowchart - Swimlanes - Mind Maps - BPMN - Network Diagram - CiscoNetwork Diagram - Rack Diagram - Server Layout Diagram - UMLActivity Diagram - Business Process Diagram - Process Flow -Chevron Diagram You can quickly select and change BPMN activity,event and gateway types by using the special shape selectoravailable to all BPMN shapes. The flowchart shapes in this tool arenot images can be re-sized without loosing quality. You cancustomize the look of the shapes by applying background color andalso change the font color and size of the text. ❝Exercise complete control over your screens white balance, tintand brightness level - Finally!❞ I initially made Screen Balancefor personal use - I am extremely pleased with the result and I amsure you will like it too. ❝Root NOT needed❞ UPDATES ★ Auto-sleepswhen incompatible windows encountered (e.g. Package Installers) ★Toggle on/off from notification tray - in Android Jellybean (4.1)and over. ★ Save color profiles. ★ Due to popular demand, I haveadded RGB adjuster to allow you to create your own color filters. ★Again due to popular demand, I have added option of adjusting thescreen contrast ... This vastly improves the readability of yourscreen at night. It also allows correction of harsh or over vibrantscreen colors. FEATURES ✓ First Android App to allow adjustment ofthe screens white balance - this will allow you to define howwarm/cool the screen appears and can be useful to correct odd tintsthat can be found on many screens. ✓ Reduce brightness levels tobelow what Android normally allows - prevents night time strain,especially on AMOLED screens. ✓ Reduce Black Crush/Clipping on manydevices including the recent Pixel 3 ✓ Apply color tint to thescreen - this is used to apply a color filter, e.g. a red tint suchthat you can use it in really dark environments, e.g. star gazingor simply reading at night. ✓ Safety feature to auto resetbrightness if set too low by accident. ✓ Dark and Light themes -allows you to accurately test white balance and prevent eye strainat night and to test your color balance. ✓ Independently adjustbrightness and tint as per your requirements. ✓ Due to populardemand, I have ensured that the App stops from appearing on theAndroid task list. ✓ Apply settings automatically on device boot. ✓Save color profiles and settings. ✓ Inherently low resource usewith no noticeable impact on performance and battery.